Virgin Holidays has formed a new strategic partnership with Next and called upon YourStudio for creative design for the venture. Since Virgin Holidays’ latest innovation, the v-rooms experience stores, as recently debuted in St David’s shopping centre in Cardiff, Virgin Holidays seized the opportunity to evolve a unique and engaging experience offer for their concessions within Next stores. YourStudio, a long-standing design partner of Virgin Holidays, took inspiration from the successful new v-rooms flagship store concept but adapted towards the nature of Next’s customer base, creating a retail sanctuary that will feel enjoyable to dwell in and inspiring to think about your potential holiday adventure. 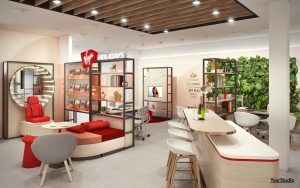 The new shop-in-shops from Virgin Holidays at Next will open between now and July across England, Scotland and Northern Ireland over multiple sites. The partnership is the first UK tie-up of its kind between a retailer and a fashion brand and supports the strategy of Virgin Holidays and Next to target a “core family demographic”. The new stores include Crawley Country Oaks, Belfast Donegal Place and York Vanguard Retail Park. The Virgin Holidays environments within Next have been created to provide an oasis of calm where customers can explore, feel inspired and have the chance to relax whilst designing their ultimate getaway with Virgin Holidays consultants and experts. Stores will feature a green living wall, soft ottoman seating, a champagne bar and key stores will include a world’s first- an in-store rollercoaster where you can travel through some of Virgin Holiday’s must-see destinations, from African safaris to a night in Vegas. The space is calm, reassuring and has a colour palette with soft-hues, rose golds and metallics. The new space provides space to connect, discover, relax and engage with the team.